I made this delicious lasagna the other night kind of on a whim. I had been thinking about making a lasagna with a fresh tomato sauce, gluten-free noodles, and substituting the cheese for cashew cheese. I got home from a friend’s book signing event on Tuesday and decided I would see if I could throw it together. Lasagnas tend to be a bit labor intensive, but this one isn’t bad considering I made the sauce and cheese from scratch. It probably took me about 40 minutes to put everything together and get it in the oven. 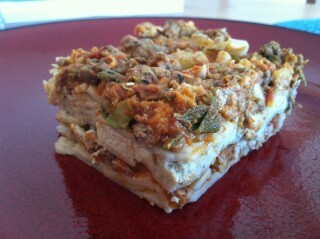 The best part about a large lasagna is that you can freeze it and it tastes even better the second time around! I used the cashew cheese in this recipe to be a substitute for ricotta cheese. As tasty as cheese is, I actually liked the cashew cheese much better. It had a great texture and wonderful, rich flavor. It is also slightly sweet, which was a nice compliment to the heirloom tomatoes that I used. I hope you will enjoy this recipe! Start by making the sauce. Add diced tomatoes, garlic, oregano, basil, vinegar, sweetener, sea salt, and pepper to a large pan. Allow the sauce to come to a boil while stirring frequently. 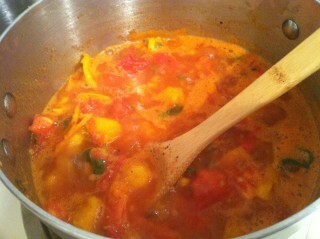 Continue to let the mixture boil until the sauce reduces down to a thicker consistency. Add zucchini and mushrooms towards the end. While the sauce is reducing, add ground beef and sausage to a frying pan. Brown the meat completely and add to the tomato sauce (fat and all…mmmm). Cover and allow the sauce to simmer but allow it to cool a few minutes before you assemble the lasagna. Prepare the cashew cheese by adding all the ingredients to a food processor. Start by adding about 1/4 cup of water. Process and continue to add small amounts of water until the “cheese” takes on the consistency of ricotta cheese. I like it to be creamy but with small bits of nuts in it for a nice texture. Set aside. Prepare noodles according to the directions on the box. 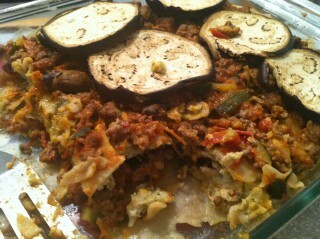 I used the Tinkyada brand brown rice lasagna noodles which are gluten-free. Be sure to stop cooking the noodles a couple minutes before done since they will be baking in the oven. You are now ready to assemble your lasagna. In a 13×9 glass dish, cover the bottom with a layer of noodles. Then top the noodles with a layer of your tomato meat sauce. Spread gently with the back of a spoon or rubber spatula. Next add another layer of noodles. Then gently spread a layer of your basil cashew cheese. You should use all the cheese in this step. 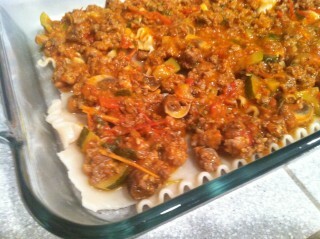 Finally, top with another layer of noodles, and then another layer of your tomato meat sauce. You can cook as is, or top with thin slices of eggplant or parmesan cheese. Cover loosely with foil and place in the oven at 375 degrees for 30-40 minutes. Remove foil for the last 5 minutes of cooking. Watch to ensure the topping does not burn. Allow the lasagna to cool for a few minutes before serving. Serve with a delicious mixed green salad. Bon Appetit! Um, YUM!! I am SO needing to make this! Let me know if you make it and how you like it. I basically went through the whole pan…only one piece left…yum!